Creating great content that shows industry expertise is one of my favorite marketing strategies. It shows visitors to my site that I know what I’m talking about and builds a credible online presence. It allows me to take information out of my brain and put somewhere so that I and others can share it in future prospect meetings, on social media, and in some cases as a reference to a support question from a client. If you haven’t already started producing quality content in the form of a blog, videos, podcasts, etc then I’d encourage you to fit it into your overall marketing strategy. In my opinion, content marketing goes together with marketing automation tools (ie Infusionsoft) like peanut butter goes with jelly. Before jumping into the nuts and bolts of how this all works, I’ve got a guide I’d like to send you (and that you can find at the bottom of this article): The Ultimate List of Blog Post Ideas. In this post, I’m laying out my content + automation strategy. It’s what I do to capture more organic traffic and leads. As a side note, this post will go into a lot of the SEO aspects of how I create content, but I’m aware of and also really like paid advertising as a traffic generation tool as well. However, I think there is too much focus today on Facebook ads in the Infusionsoft eco-system. The strategy I layout in this post is a longer-term play, but pays higher dividends in the long-run. Also, I don’t profess to be an SEO expert. This simply comes from learning from others and then experimenting with what works. For many, this can be the hardest part in getting started. I’ve heard many say that they simply don’t know what to write about. In my opinion, that’s a bad excuse; This is the easiest step in the whole process. This is your content and your business and the reality is you can write about whatever you want. However, it’s better to use data when deciding what to write about. Thankfully there are a lot of free tools that make this part easy. You may have heard the term ‘keyword research’. This is exactly what you’re doing in this step. You’re researching keywords and questions that people are searching for and talking about online. The reason this is helpful is that Google rewards you and puts you higher in search rankings for keywords and questions that people search for, if your content matches. 1. Facebook Groups. This is one my favorites because it’s easy to see and connect with real people about their problems. This is how many of my first blog posts were produced: I’d jump into the Infusionsoft Facebook User Group and find questions and comments from people who were genuinely interested in learning more. If it was something I had an expertise in and if it was getting asked often enough, I’d simply write a blog post about it or contract someone to produce the helpful information if I didn’t have the expertise myself. 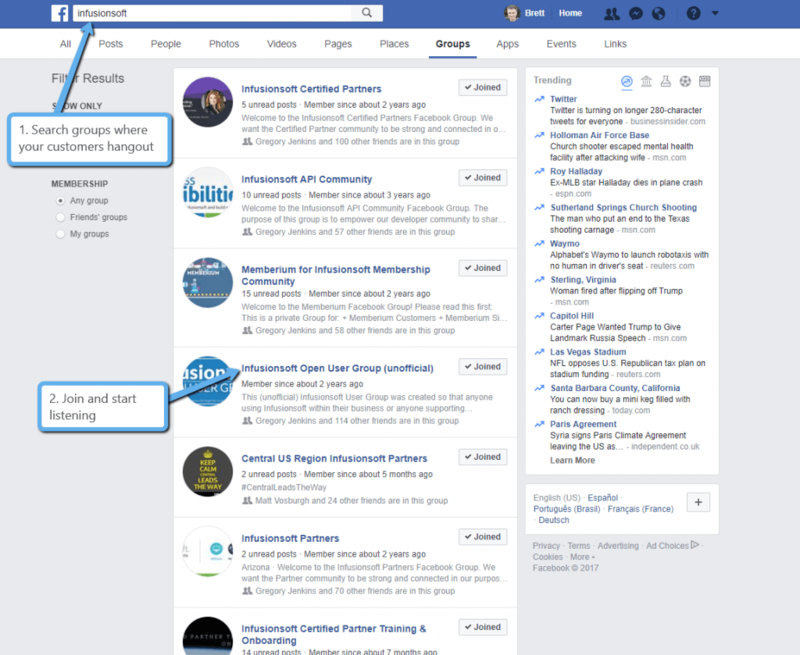 (For example, I had a few people custom code some solutions that I made available for free on my website).To get started here, do a Facebook search of groups that fit your industry and where your potential clients and customers might hang out. Join the group and then just listen.Use the search feature to look at old posts and begin writing down common questions. 2. Google Auto-suggest and Similar Searches. This is Google’s way of suggesting what you might be looking for before you type it in. I’d simply start with a topic in your industry or some other topic you’d like to create content for. You can do this by going directly to google.comIn the example above, you can see that there are a few keywords Google is telling me that are related to Infusionsoft. Some of them don’t make sense to write about, but others might.As you’re looking at keywords to begin using, you’ll want to consider “intent”. 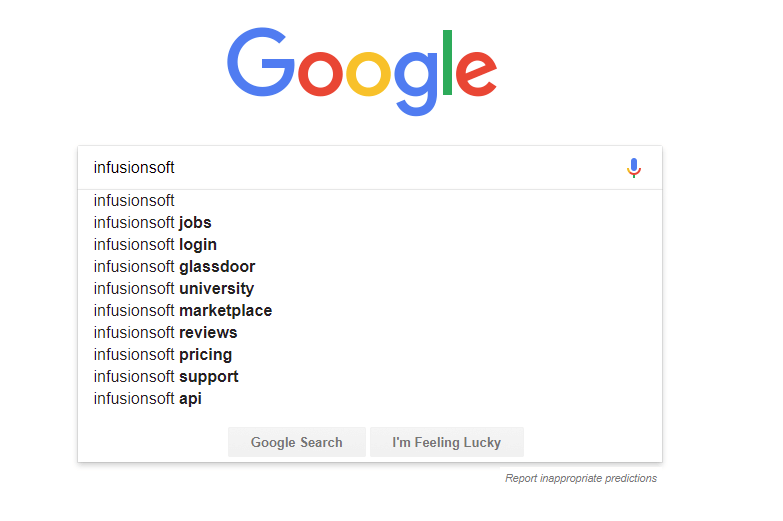 In other words, what is the reason someone is searching for that keyword? It seems logical, but in this example, I’d likely find more success finding leads by writing about “Infusionsoft pricing” than writing “Infusionsoft jobs”. 3. Answerthepublic.com. 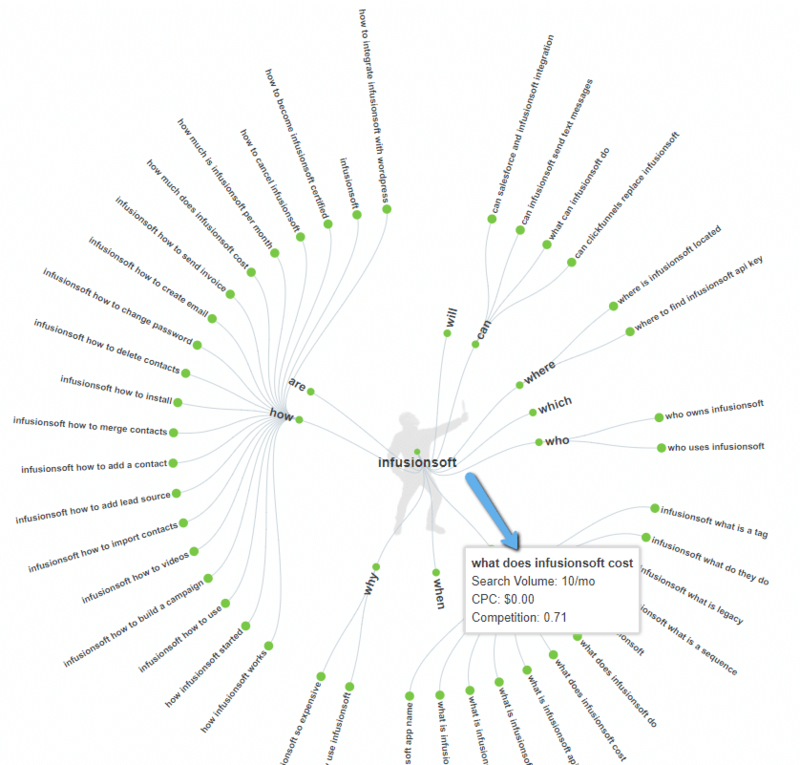 This website allows you to put in terms and visually see what information people are searching for on the internet. As a bonus you can install a Chrome extension called Keywords Everywhere to see search volume and competition (see screenshot below).Google Keyword Planner. This tool comes directly from Google and is built to let Adwords advertisers do research about what people are searching for. To access this, you simply need an Adwords account. Personally, I don’t use this tool very often anymore because it tends to give me results that are too broad for my liking. ​4. Google Keyword Planner. This tool comes directly from Google and is built to let Adwords advertisers do research about what people are searching for. To access this, you simply need an Adwords account. Personally, I don’t use this tool very often anymore because it tends to give me results that are too broad for my liking. 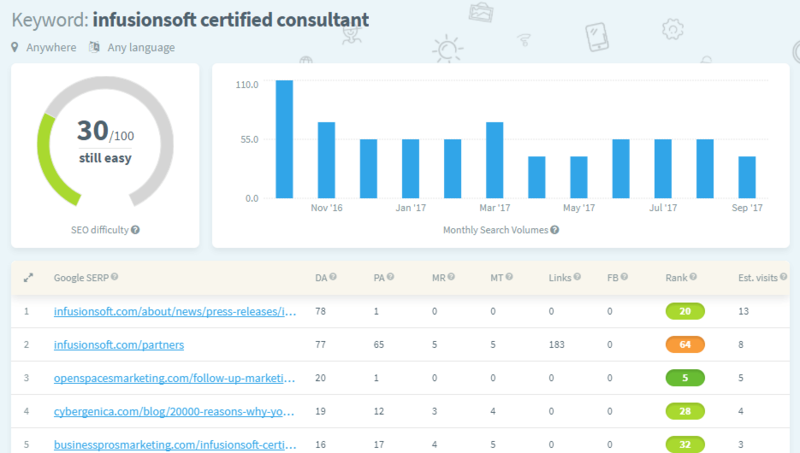 Once you’ve compiled a list of keywords you think you’d be interested in, head over to kwfinder.com to get more data about the content you’re interested in. Kwfinder.com is a great tool that allows you to do 2 free searches a day. If content marketing was my only method of marketing, I’d invest in a paid account, but the free account works great for my needs right now. This tool color codes the results by letting me know what might be easy and/or difficult to rank well on Google for. Since my website doesn’t have a lot of domain authority or “clout”, I’ll usually try to stick with the easy, green keywords. This is personal preference, but sometimes the type of keyword you’re going for can help you decide whether you want to create a podcast, video or just text article. 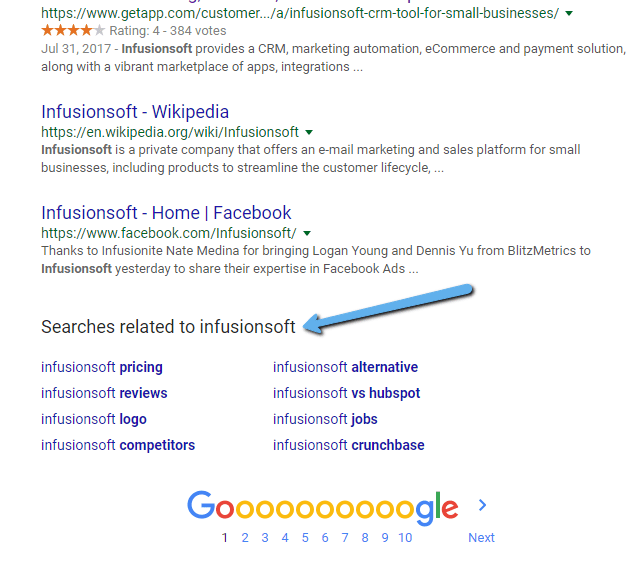 A few months ago, I found that “Infusionsoft demo” was a great keyword to go after. This type of keyword would be way better suited as a video rather than a blog post because the “intent” is that people want to visually see the features. So I put together a video, uploaded it to YouTube and followed some best practices for ranking. That particular video now shows up on page one of Google when someone searches for “Infusionsoft demo”. By the way, you can check out the video on YouTube here. There are a million things you could do to rank well on Google and other search engines, but in my opinion most of that stuff is a waste of time. Here’s my favorite method: Produce content that’s so good, people would actually pay to get access to it. If you want to be a little more scientific about it, do a search for the keyword you’re looking to rank for and then find the number one and two result. From there, simply create a better content piece than them. For example, if they have an article that’s 5,000 words, do one that has 8,000 words. If they have a video with poor audio, do a video with great info and excellent audio. The other thing you’ll want to do is make sure you download the YoastSEO plugin for WordPress and follow their instructions on using it. This plugin allows you to enter your keyword and get realtime feedback about how your content is doing. In my experience, this step is the most time-consuming and rewarding part of the entire process. If you’re doing it right, this will take the bulk of your time. Content upgrades are additional pieces of content that relate to your free content, but the catch is: your audience must opt-in to receive it. In other words, it’s a lead magnet with a form that’s embedded on the page of the content piece (like you see at the bottom of this page). This could also be slide in or pop up. The trick is, it should be related to the article or content you’re producing, so there’s congruency between what they’re reading and what you’re offering. Using Infusionsoft or another automation tool, deliver the content they’ve requested and ask for permission to send follow up information. When done correctly, you can continue to follow up and present your next offer (like a webinar, consultation or tripwire). There are a ton of other articles about this process (plus it’s something my business will help you do really well, so I won’t spend a ton of time on this step). If you’re interested, you can contact us here. Use traditional marketing methods like sending emails and use forums/groups to distribute your content. If it’s part of an ad strategy, make sure you have your retargeting set up so that you can track interest and remarket to those individuals finding your page. You won’t see results right away and some blog posts won’t get the traction you thought they would. You have to remain consistent, even when you don’t see immediate results. One of my favorite YouTubers went from 0 subscribers to 450 subscribers at 10,000+ views by simply posting a talking head/screen sharing video to YouTube every day for 120 days straight. Just two years later, he sits at 35,000 subscribers. To make sure this strategy actually happens you need an editorial calendar and planner. There are a TON of them out there. I’d start with a simple spreadsheet. Ideas: This is where I put all my ideas and identified keywords, even if the idea itself isn’t my favorite. Sometimes, it will spark other ideas as I come back to it later. To Do: These are the ones I’ve identified in the “Ideas” list as something I’d like to write about. This is also where I begin to formulate and outline what the piece will look like. Editing and QA: This is where I’ll hand it off to a team member to review and check for any grammatical mistakes or to add any additional input. Promoting: As it sounds, content by itself without promotion isn’t very helpful. This is the stage where I’ll send out emails and social media posts to get engagement. Done: This is where I keep completed blog posts. While I’m no expert, this strategy has certainly produced clients for my business and I’m confident it will help yours as well. 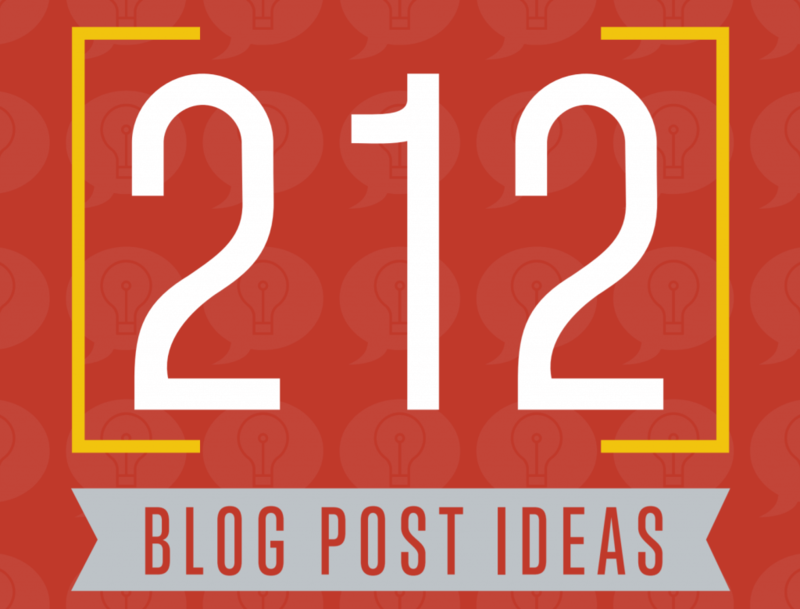 Check out the Ultimate List of Blog Post Ideas by entering your name and email below. What does your method look like? Let me know in the comments below.